The O’Reilly-Wapstra Lab: Research with BITE! The BITE Group is based at The University of Tasmania and our research focuses on two main streams: biotic interactions and terrestrial ecology in forest systems. We employ a genetic framework to better understand the evolutionary ecology of forest trees, how they influence interactions with associated herbivores and pathogens, and how they have extended biotic community and ecosystem effects. We investigate and address wildlife management and biodiversity issues in forested landscapes of high commercial, conservation and restoration value. The group is lead by Julianne O’Reilly-Wapstra and if you want to know more about what we do, keep reading this site, or email Julianne on joreilly@utas.edu.au. It would be great to hear from you. McKiernan A.B., Hovenden M.J., Brodribb T.J., Potts B.M., Davies N.W., O’Reilly-Wapstra J.M., (in press). Effect of limited water availability on foliar plant secondary metabolites of two Eucalyptus species. Environmental and Experimental Botany. to produce great research so keep an eye out for what we get up to. 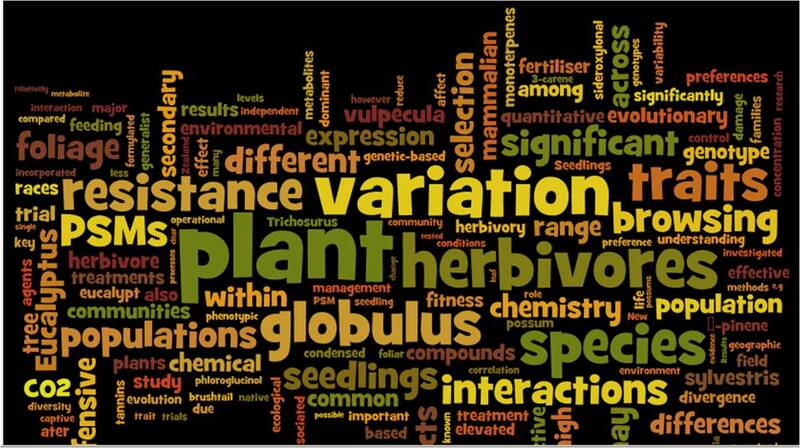 February 2014: Variable patterns of inheritance of ecologically important plant secondary metabolites in an inter-specific eucalypt hybrid, FEM Vol: 318, April 2014, Pages 71–77. October 2013: Thanks to Julia Koricheva for a fantastic workshop on meta-analysis at UTAS. We had a great 2 days. August 2013: Thanks to Jenny Rowntree (University of Manchester) and Jordi Moya-Larano (Spanish National Research Council) for organising a fabulous symposium on 'Evolution in ecological communities' at INTECOL 2013. Marc Johnson (University of Toronto) gave a great keynote in the symposium. Also congratulations to the UTAS students who presented their work - it was an inspiring conference and we look forward to the next one in Beijing in 2017. Congratulations Helen Stephens on graduating with your PhD! Adam McKiernan and I are heading to London for INTECOL 2013. Check out the two symposia we are speaking in "Ecosystem ecology and dynamics" and "Evolution in ecological communities". April 2013: Congratulations John Senior on your new paper in PLOS ONE "Phylogenetic Responses of Forest Trees to Global Change"